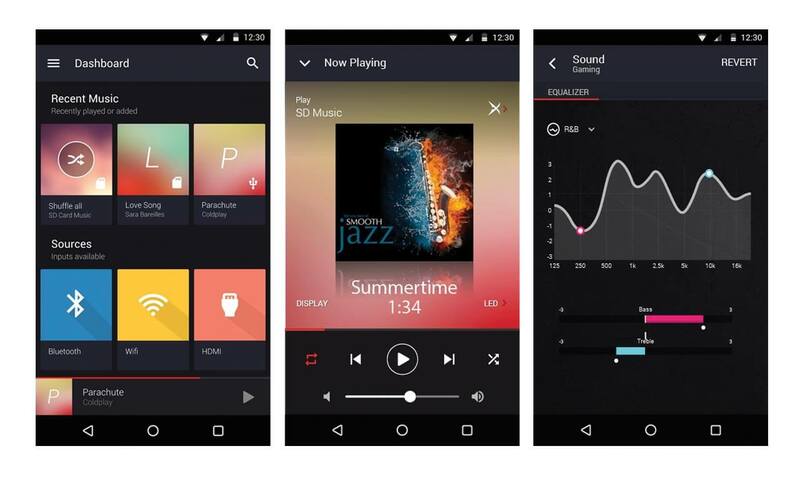 Imagine a world where music listening is transformed into a magical auditory experience. This is the 15.2 world of super wide extreme fidelity. We call this SuperWide X-Fi™. In this realm, every audio stream regardless of quality is algorithmically metamorphosized to an eXtreme Fidelity level of 24-bit 192kHz high-resolution audio and expanded three-dimensionally into a 15.2 super wide soundstage. In the other world, we bring the most immersive 3D audio experience with the latest Dolby Atmos® technology, deployed in premium cinemas, straight to your home – only better. 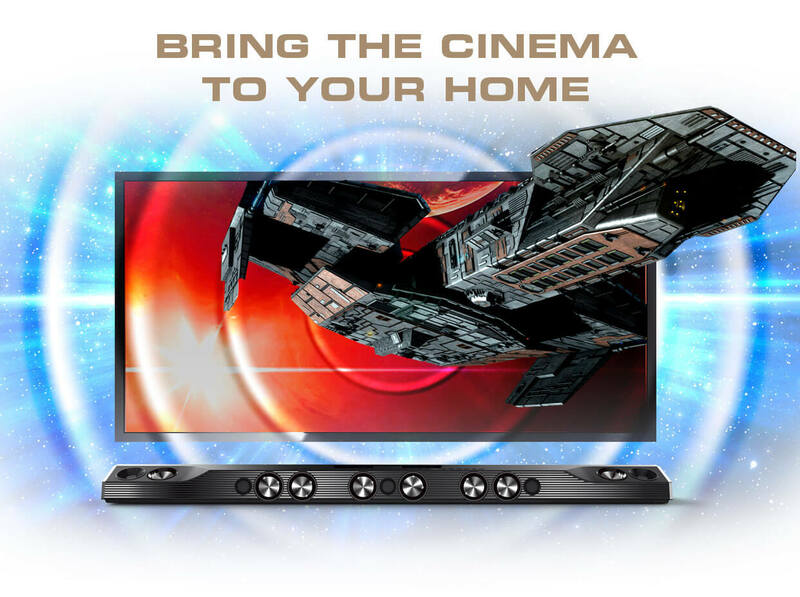 Movies will never be same again with cinematic audio that not only flows around you, but also above you. One would expect all these wizardries to come from a convoluted array of expensive systems. Instead, it is a beautiful sleek one-piece system, sans messy cables. Together with an exquisite wireless subwoofer akin to designer furniture, the X-Fi Sonic Carrier is truly a piece of art. After a long and arduous journey, what started as a crazy idea and an impossible dream has finally come true. We have created a work of art so magical, so magnificent, so mind-blowing, industry experts have dubbed it the “Soundbar of the Gods”. 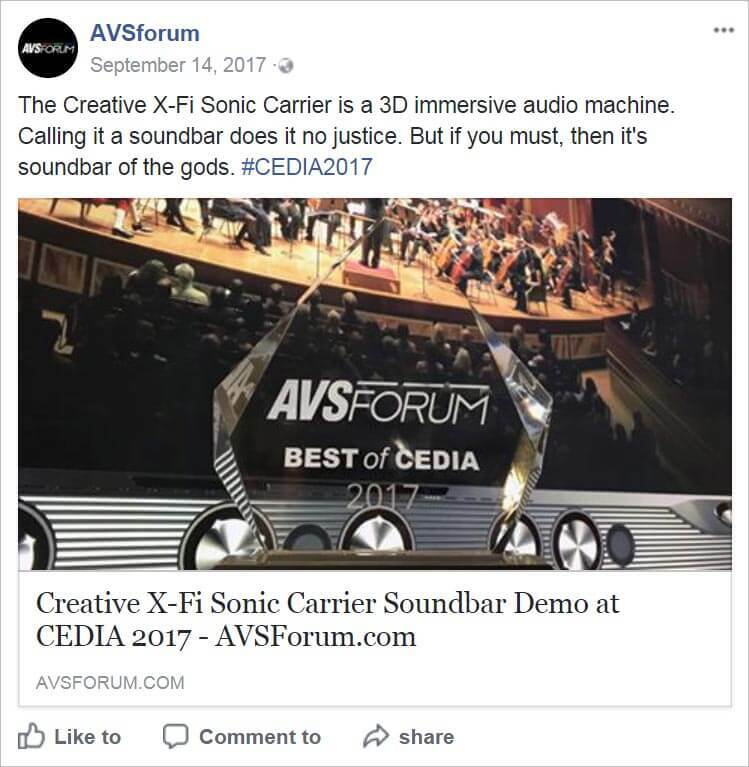 The Sonic Carrier was awarded the Best of CEDIA 2017 Award by AVS Forum, the world's largest AV-enthusiast forum site. The Sonic Carrier delivers a mind-boggling 1000W RMS of brute power. The 600W RMS wireless sub can punch so deep that it is virtually hell-shattering way down deep. 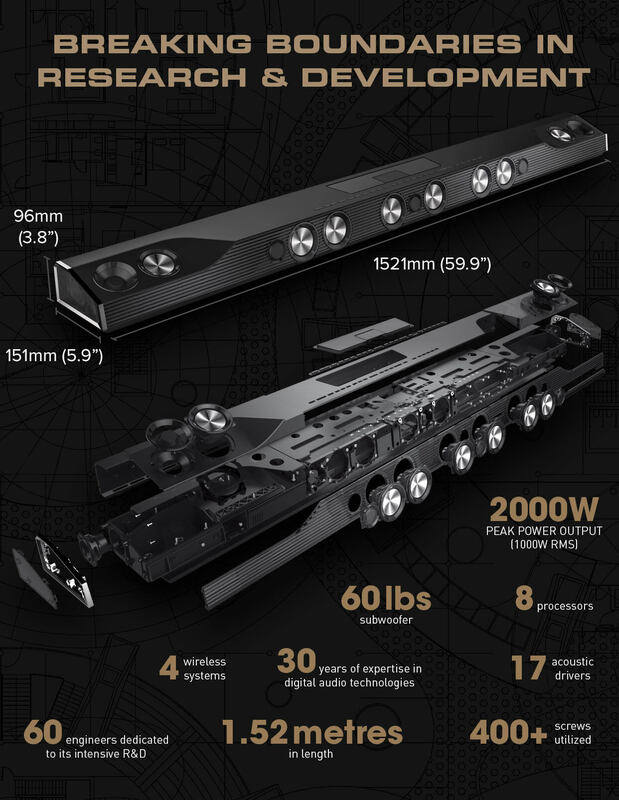 Powered by 8 processors, the Sonic Carrier is not only capable of high-resolution audio playback; it also features an Ultra HD video engine that supports 4K 60fps video playback of local and online content. Featuring 3 distinct wireless technologies, the Sonic Carrier offers 2 separate Wi-Fi® solutions for audio and video streaming, Bluetooth®, and a zero-latency speaker-to-speaker link to up to 4 subwoofers. The intelligence of the Sonic Carrier can be upgraded by a simple software download or even a hardware module replacement – it’s virtually future-proof! The demonstration of the Creative Sonic Carrier was a genuine revelation, the likes of which I haven’t experienced in ages. It excelled as both a room-filling home theatre system and as an impressive implementation of Dolby Atmos technology. Hard to believe that it was just the one box, plus subs. Introducing a radically new audio technology that elevates the auditory journey to a totally different dimension. So breathtaking, it goes beyond one’s imagination. 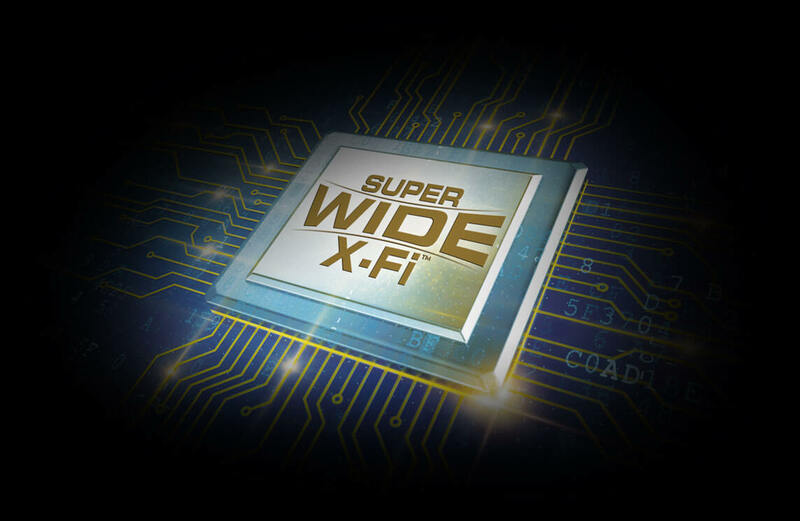 When SuperWide X-Fi touches any common stereo source it transports the listener to a magical three dimensional audio utopia that transcends a traditional left-right stereo experience. This is the Audio of Tomorrow... the next leap in the evolution of music listening. This paradigm shift in audio enjoyment delivers an unparalleled level of detail, clarity, and image specificity, and a super wide soundstage; bringing forth a new revelation to your auditory senses that defies the norms of conventional stereo. 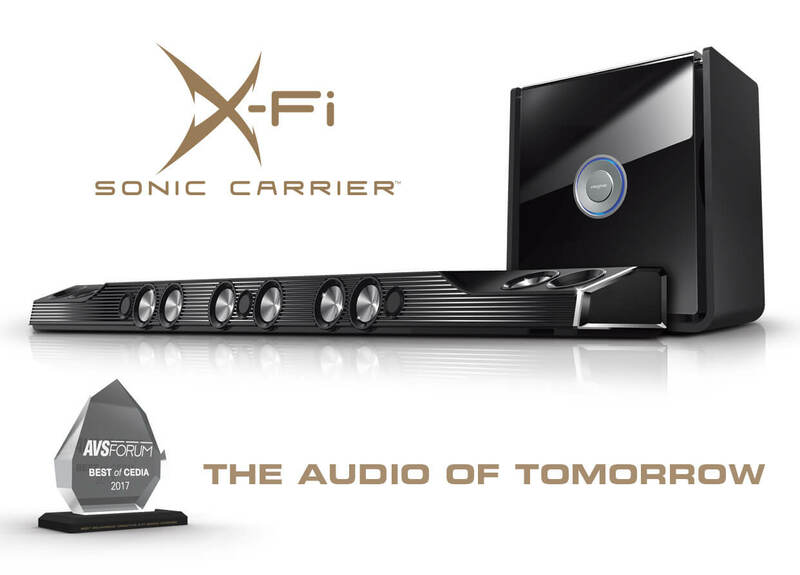 And although the Sonic Carrier delivers a good Hi-Res standard stereo experience, you can now go even further with the SuperWide X-Fi technology. Why stop at the ordinary? When a stereo signal is fed into the Sonic Carrier, the X-Fi quad-core DSP (digital signal processor) up-scales all input to 24-bit HD audio format. It then intelligently restores the highs and lows of music, extending the dynamic range; giving users enhanced detail and clarity. The two channel stereo signal is then up-mixed to a X-Fi 7.1 signal. But it doesn’t end there. The 15.2 SuperWide X-Fi algorithm is so complex and so demanding, it requires an additional high-performance DSP to complete the task. This additional EAX 15.2 DSP is capable of processing and assigning any audio input signal into 16 DSP-controlled outputs. Running on the EAX 15.2 DSP is our proprietary 15.2 SuperWide X-Fi algorithm that processes the incoming X-Fi 7.1 signal. The output is then assigned to the relevant 16 directional channels that correspond to the driver array in the Sonic Carrier (9 front-firing, 2 side-firing, 4 up-firing, and 1 bass). The low-pass filtered bass channel is digitally transmitted to the subwoofer unit, where it is then split into two channels, which go into a pair of DACs (digital-analog converters). The analog DAC outputs, which can be separately tuned, are then fed into two 300W RMS amplifiers. The 9 front-firing channels consisting of the left, center, and right directional channels are passed through 9 high-resolution DACs, feeding 9 high-quality, highly efficient 60W RMS Class-D amplifiers. This in turn, feeds 9 highly precise pistonic drivers arranged in a TMM-MTM-MMT configuration. Likewise, the 2 up-firing channels consisting of the top-left and top-right directional channels are passed through 4 high-resolution DACs, feeding 4 high-quality, highly efficient 60W RMS Class-D amplifiers. This in turn, feeds 4 highly precise pistonic drivers arranged in a TM-MT configuration. Similarly, the 2 side-firing channels consist of 2 full-range drivers powered by two DACs and two 60W RMS Class-D amplifiers. 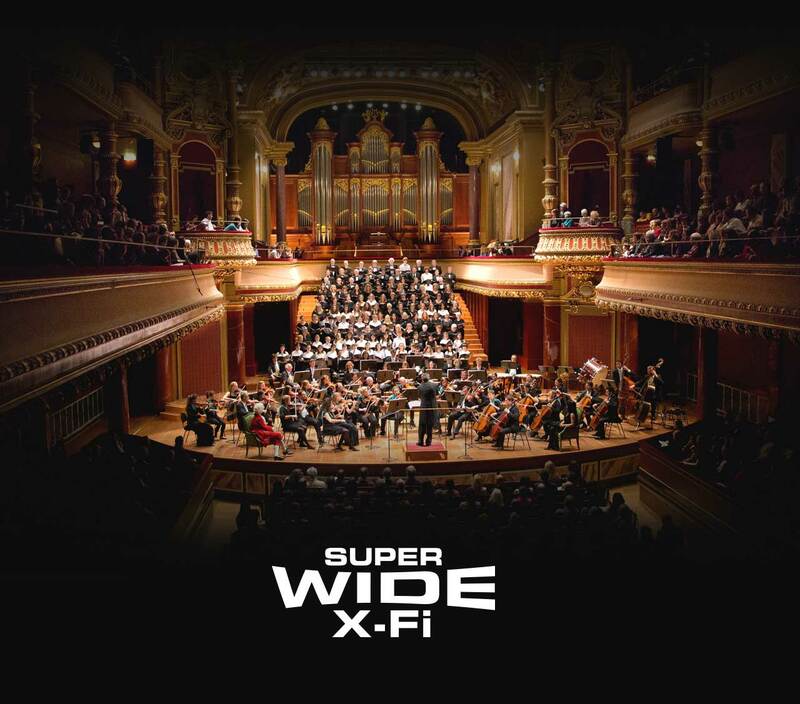 The development of the 15.2 SuperWide X-Fi technology started off with a mathematically-derived algorithm, optimized through never-ending listening sessions by our expert in-house acoustic engineers to cater for different listening modes, environments and preferences. Each tuning session involved tuning all the 15 drivers individually as separate directional channels as well as collectively as a system of drivers. For example, the left channel in a TMM configuration must take in not only the left, but also parts of the center, right, rear and surround channels of the 7.1 signal. 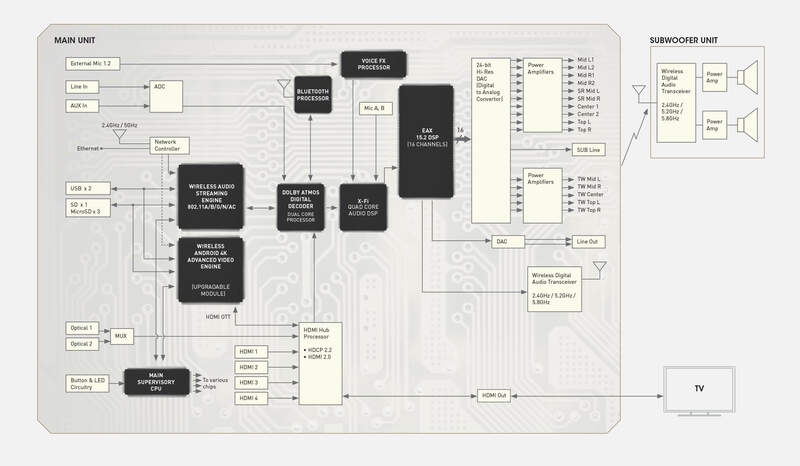 And then, this convoluted left channel is applied to the TMM drivers differently through another sub-algorithm. After going through each channel, the overall system has to be fine-tuned all over again. 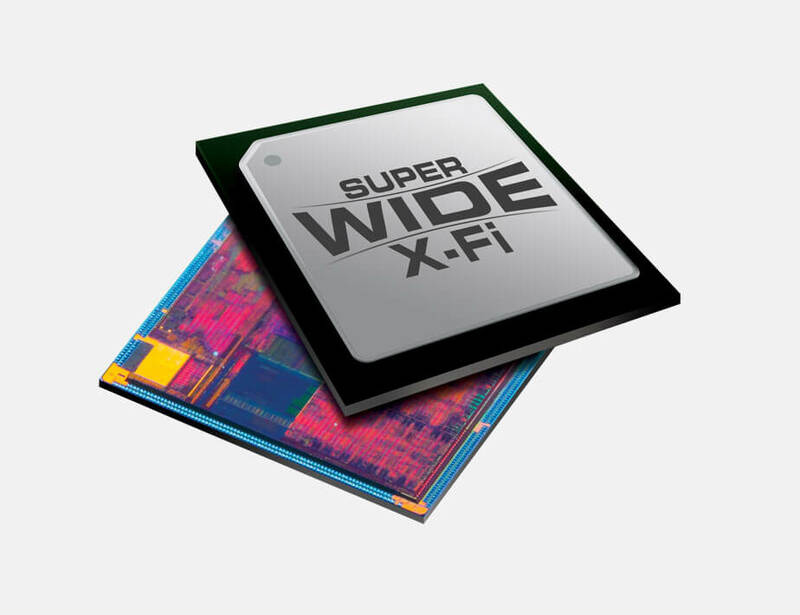 Lastly, the 15.2 SuperWide X-Fi technology is a highly intricate fusion of hardware and software design. Not only is the algorithm important, the hardware also plays a very important role in delivering the desired effect. For instance, the customized driver design and the unique speaker arrangement are intricately tied to the specific algorithm design to deliver an optimum experience. Even the design of individual acoustic chambers and power amplifiers are crucial. 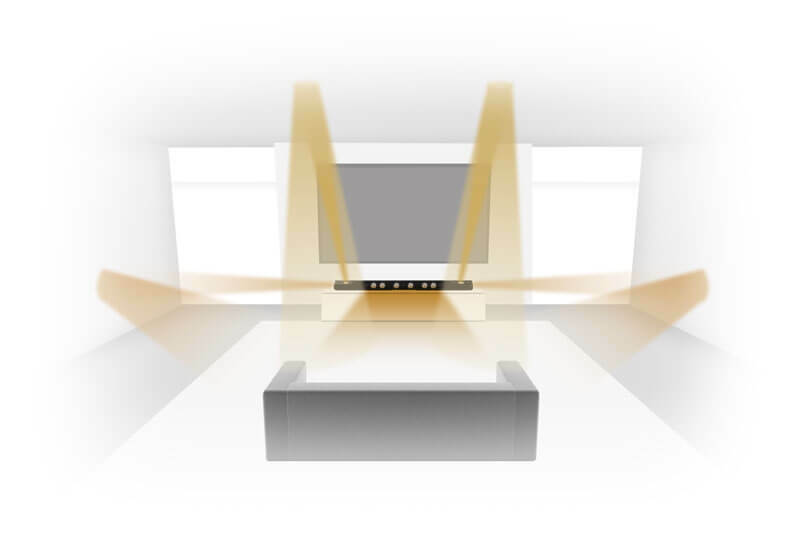 And when it comes to Dolby Atmos, the signal is fed through the X-Fi DSP to the EAX 15.2 DSP to be further processed and enhanced to give wider and more realistic soundstage. Since it was unveiled at key exhibitions in the US, Sonic Carrier's SuperWide X-Fi has blown expert reviewers away with its near magical ability to deliver unparalleled levels of immersive lifelike audio; a spellbinding audio experience where what was heard went way beyond the perceived physical limitations of a one-piece speaker unit and a subwoofer. An industry expert went so far as to describe the audio experience as sonic holography, and not only that, an experience that happened in a noisy open show floor, all without the aid of nearby reflective walls or ceiling. Another reviewer was floored by how Super X-Fi gave even compressed stereo sources a panoramic-like soundstage. And when it comes to music-listening, SuperWide X-Fi was observed to deliver an experience like that coming from a high-end stereo system, and not a one-piece unit. One reviewer was so taken by what SuperWide X-Fi did to music that he actually recommended never turning it off! With SuperWide X-Fi, even movie trailers from sources like YouTube sounded like an experience from a real cinema with an array of multiple speakers that can cost hundreds of thousands of dollars. My lord, it was incredible. The Sonic Carrier was able to fill Creative’s booth on the busy show floor (at E3) with full, rich sound with the aid of the company’s proprietary SuperWide X-Fi tech that can give even compressed stereo sources a panoramic-like soundstage. But more impressively, surround sounds like a bird’s song or its fluttering wings felt like they were happening behind and above me. A suite of adaptive audio algorithms in the X-Fi DSP upscales standard stereo sources to 24-bit high-resolution audio, and further enhances it to an Xtreme Fidelity (X-Fi) level. It works by analyzing the audio signal to understand the spatial and dynamic nature of the program material, transparently enhancing the audio signal such that the quality of almost any audio source could be improved. The X-Fi Upmixing algorithm is able to extract natural, enveloping sound from legacy material into a 7.1 signal. That is because these audio sources usually contain information about the recording venue’s ambience, and even a sense of height. The 7.1 signal will be further upmixed into a 15.2 signal in the EAX 15.2 DSP. The level and extent of processing can be fully customized via software, giving you full control. A Direct Mode is also available for users who want to experience their audio source in its original form. Generally, legacy audio content has been compromised in order to optimize the listening experience within the dual constraints of the 16-bit resolution of CDs/MP3s, as well as the typical limitations of playback systems. X-Fi DRE was created with the realization of this limitation. X-Fi DRE intelligently remasters your legacy audio material, freeing the audio from the constraints of the original, lower resolution mediums such as CDs and MP3s, conferring many of the advantages presented by high-resolution recording and delivery formats. 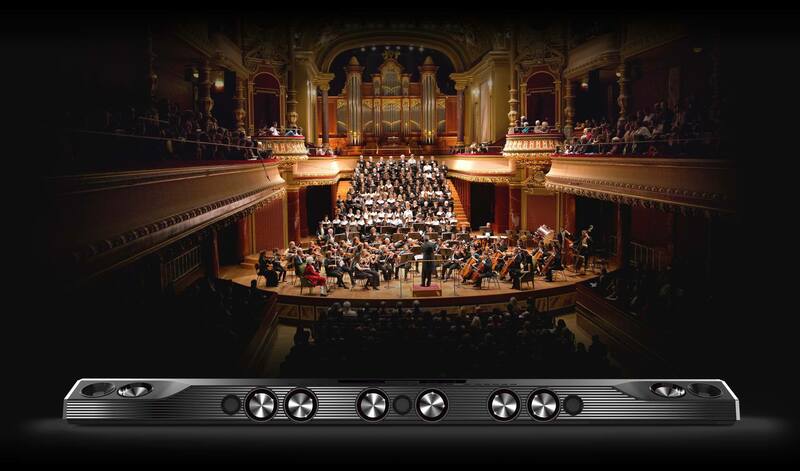 Most audio systems on the market, regardless of claims of support for high resolution playback, do not have the dynamic range needed to reproduce realistic musical dynamics. The Sonic Carrier, on the other hand, has ample dynamic range and detail resolution. This allows the X-Fi DRE to restore and enhance legacy audio material to its full potential. This is achieved by analyzing the audio signal in real-time, distinguishing specific transient sound events that suffer from dynamic compression during the recording process, and selectively restoring their lost dynamics. The typical effect of this restoration produces crisper highs, punchier mid-range percussion, and stronger kick bass hits. X-Fi DRE is particularly effective in improving the impoverished high-frequency sound of data-compressed audio, such as MP3s – giving enhanced detail and clarity. Volume levels can change dramatically within a playlist, between different source content, during transitions between TV programs, commercials, and between different TV channels. Yet the listener generally desires to have the volume they hear remain at a consistently comfortable level while retaining the dynamics in a track. Setting the amplifier volume control constantly between tracks in a playlist can be tricky and frustrating. X-Fi Smart Volume prevents abrupt volume fluctuation during playback between tracks by automatically and continuously monitoring volume and smoothly applying gain and attenuation to compensate for those changes. X-Fi Smart Volume Night Mode gives you clear dialogs without way-too-loud action scenes. It suppresses the loudness of the explosion but gains up the volume of dialog. The user is able to enjoy his favorite movie at night without disturbing his family or neighbors. X-Fi Dialog Plus enhances the voices in movies for clearer dialog, allowing the listener to hear the dialog over the rest of the soundtrack and over ambient noise in the listening environment. 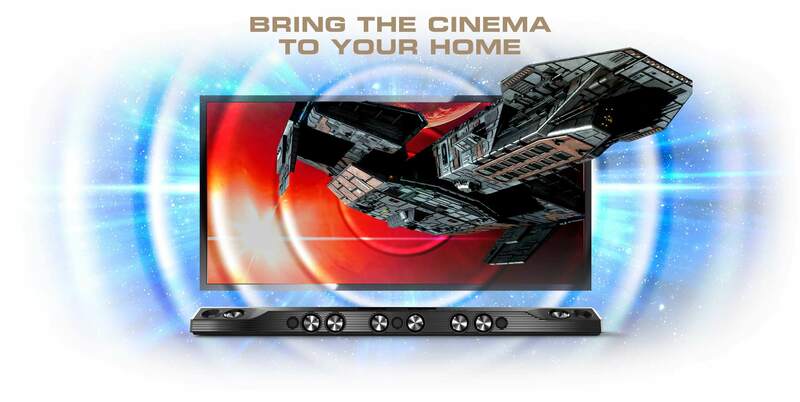 The groundbreaking Sonic Carrier delivers the latest Dolby Atmos 5.1.2 technology. Dolby Atmos creates moving audio – sound that can be precisely placed and moved anywhere in three-dimensional space, including overhead. It brings entertainment alive all around the audience in a powerfully immersive and emotive experience. Backed by our in-depth knowledge of the way sound is perceived, the Sonic Carrier’s 11.2.4 audio system employs 4 up-firing drivers to perfectly reproduce the height information present in Dolby Atmos content by reflecting the sound off the ceiling and back down to you. This completes the surround sound delivered by the 11 front and side-firing drivers for a full 360° surround and 3D audio experience. I watched the theatrical release of Avatar with my kids in a real cinema. The Avatar demo clip they showed on the new Creative Sonic Carrier was even better than that cinema experience. I could hear the fine details in the jungle atmosphere enveloping me – even the sound of the bugs flying around and above me. It was a hyper-realistic experience. 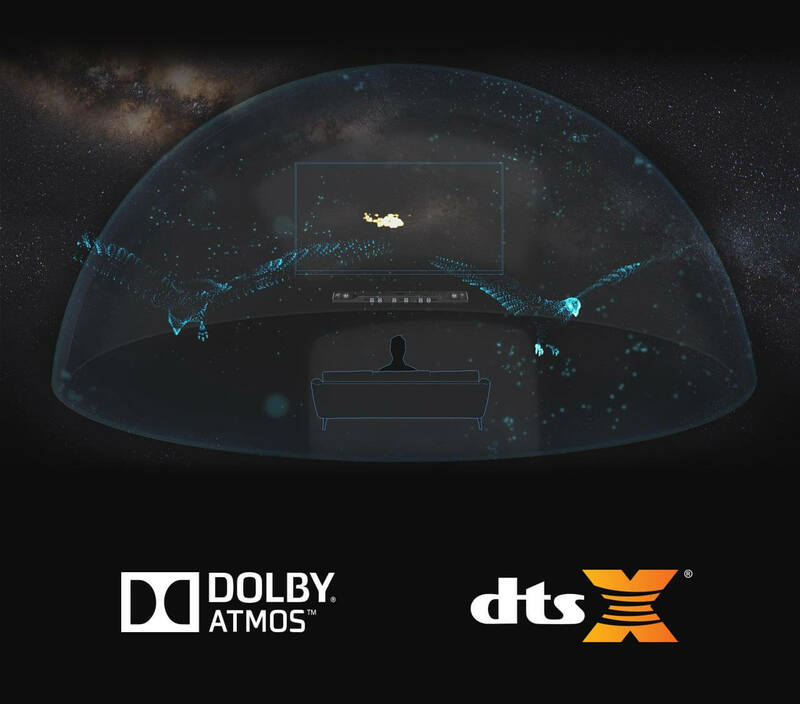 With DTS:X, as well as X-Fi Sonic Carrier’s current Dolby Atmos® support, you will have access to an even larger portfolio of advanced surround sound movies & games. 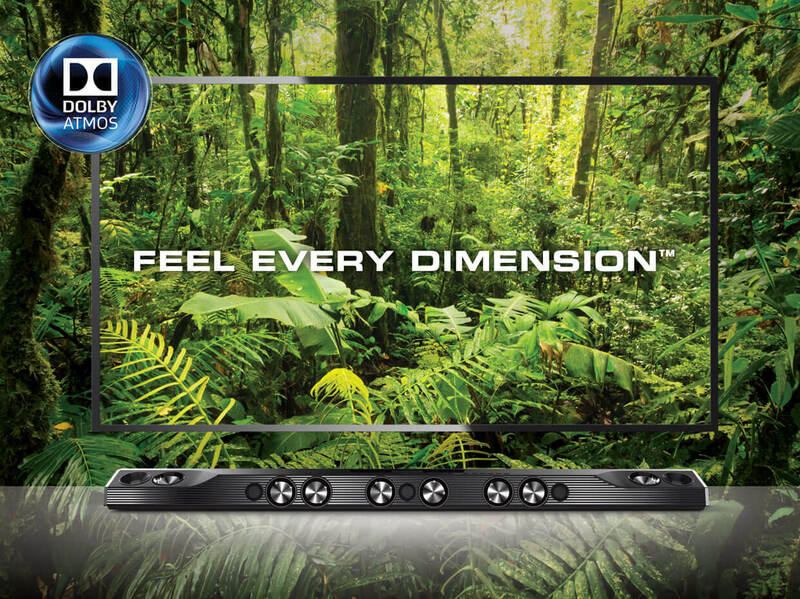 DTS:X, the latest technology from DTS, delivers immersive moving surround sound; and now includes a height element. 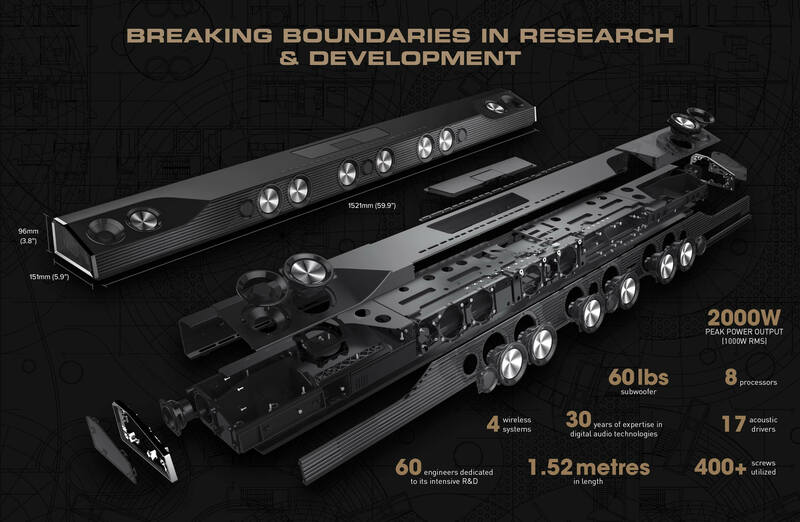 DTS:X places sound where it would occur naturally in space, creating the most lifelike, multi-dimensional audio experience ever. This improved immersion and heightened realism makes horror movies scarier, comedies more laugh-out-loud, and car chase scenes even more intense. You will now be able to experience the latest DTS:X and all preceding DTS surround sound content through the Sonic Carrier. This will be available as a firmware upgrade when ready. Powered by the latest Android™-based 64-bit quad-core 4K Ultra HD video processor, the Sonic Carrier lets you enjoy stunning High-Definition 4K videos at extremely smooth 60Hz frame rate. 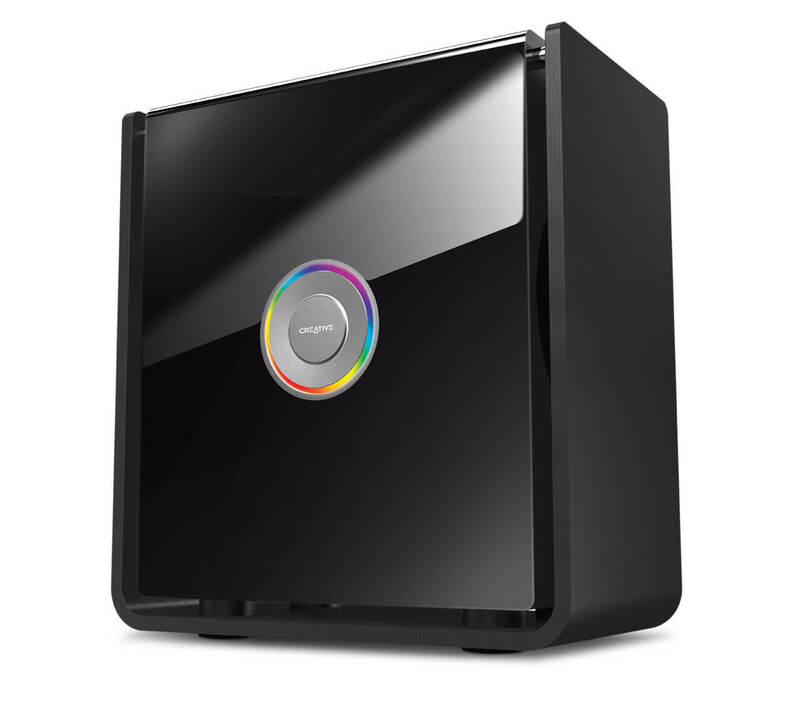 It also supports real-time streaming, screen-casting and local media playback via USB port. 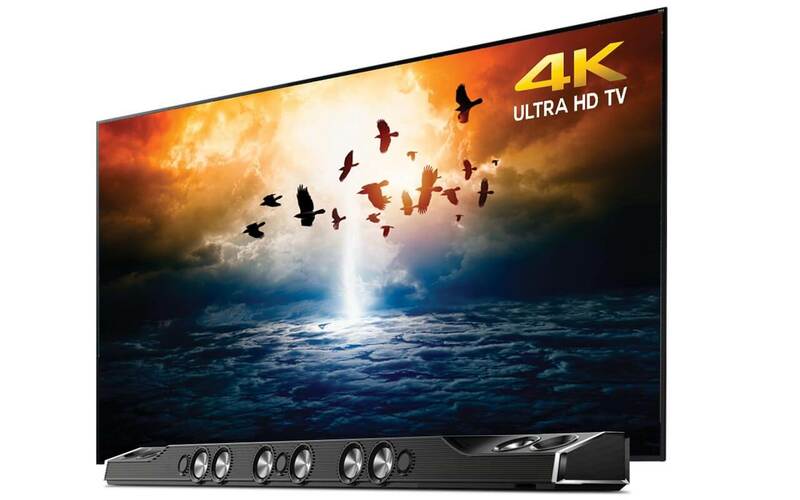 Supporting the highest HDMI specifications, HDMI 2.0a and HDCP 2.2, you can be assured of future-proof connectivity to the latest 4K Ultra HD TVs and newest content compatibility. Featuring a whopping 8 processors, the Sonic Carrier is an intelligent technology powerhouse that delivers lifelike 24-bit/192kHz high-resolution audio and high-definition 4K 60fps videos. 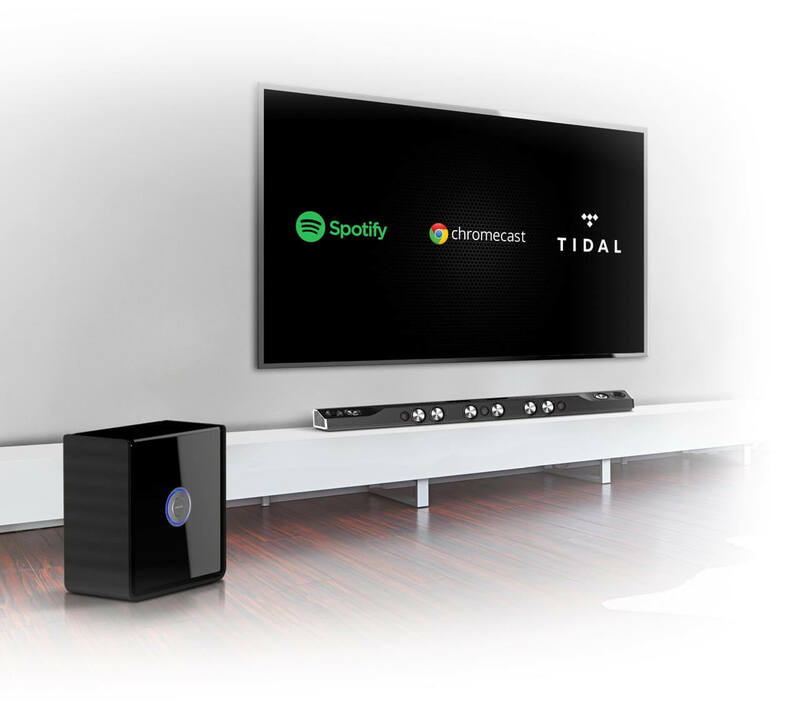 In addition, the Sonic Carrier supports various network audio protocols as well as popular online movie and music streaming services are supported so that you can access content from all over the world. The Sonic Carrier is also designed as a carrier to host other playback dongles such as Amazon® Fire TV Stick and Intel® Compute Stick. The state-of-the-art video engine can even be upgraded in the future, when available. The Sonic Carrier main unit exudes the presence of a well crafted body, complemented by stunningly impressive technologies inside. Forged with extreme precision on an extensively CNC machined, finely polished and anodized aluminum chassis in cool black, it features an immensely strong and acoustically inert double walled enclosure. 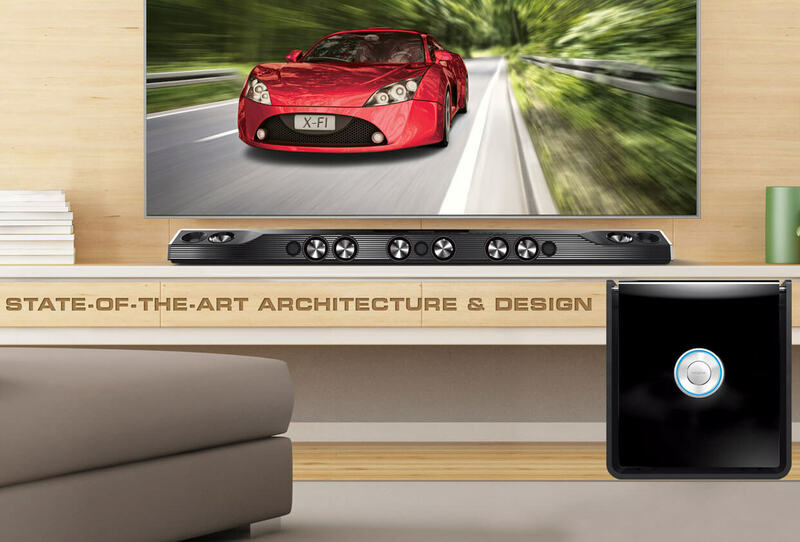 Delivering an astoundingly wide soundstage unmatched by conventional sound bars, the Sonic Carrier’s generous 60” width matches large TVs of today, yet is appealingly slim at a mere 3.8” tall and 5.9” deep. The design intent behind the subwoofer ID is to create a perception of an inner module floating magically within an outer frame. We’ve also added an elegant glowing backlight behind the unit’s metallic badge that is capable of transforming into an amazing 16-million color light-show if desired. The subwoofer also comes in an optional super premium high-gloss piano finish. This finishing involves applying 8 layers of coating where each layer is painstakingly hand-polished, spray-coated, and baked overnight. This arduous process is repeated 8 times over a period of 8 days to achieve an enviable high-gloss piano finish. With this new premium finishing, the subwoofer is bound to become a head-turner in your living room, not to mention ‘wife-friendly’ thanks to its wireless clutter-free connectivity! With the system arranged in an 11.2.4 configuration, these drivers are arranged in an array with 11 front and side-firing drivers reproducing front and surround sound, and 4 up-firing drivers reproducing a realistic sense of height. The drivers are housed in 5 speaker modules and 10 individualized sealed chambers to achieve an optimal crosstalk response from adjacent speakers and to produce multiple speaker effects. With each channel individually driven by a DSP-controlled amplifier, the Sonic Carrier delivers a total of 1000W RMS power. 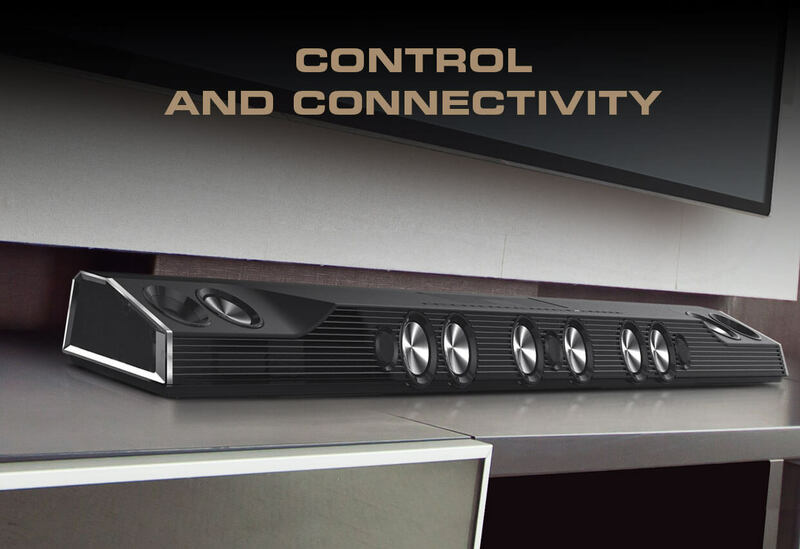 The Sonic Carrier also supports zero-latency wireless speaker-to-speaker link to up to 4 subwoofer units. Consisting of 6 midbass drivers, 3 super tweeters and 2 full-range drivers, the front and side-firing channels deliver spacious stereo and enveloping surround sound. 6 midbass drivers and 3 super tweeters make up the front-left, front-center and front-right channels in a TMM, MTM, MMT configuration. 2 side-firing full-range drivers, mounted in a unique way, work together with Dolby Atmos or the EAX 15.2 DSP processing to deliver the rear audio channels and create an enveloping 360° surround sound – eliminating the need for additional side and rear speakers. Two 2.75” aluminium-magnesium cone drivers and two 1” super tweeters form the up-firing channels. The tweeters are waveguide loaded for optimal directivity control. Pointing up at 70º, they project and deflect audio from the ceiling of a room for an enveloping audio experience. With Dolby Atmos or our EAX 15.2 DSP processing, the 4 up-firing drivers deliver the sensation of sound above you, without the hassle of installing physical speakers over your head. The 2.75” midbass drivers utilize an extremely stiff aluminium-magnesium cone that is coupled to a carefully optimized motor and suspension system for high output capability and low distortion. Each operates as a perfect piston within its operational bandwidth. These provide precise midbass, detailed natural midrange with no loss of detail associated with softer cone and dome materials. With these drivers spreading across the 60” body, the Sonic Carrier delivers an astoundingly wide soundstage that is unmatched by conventional sound bars. 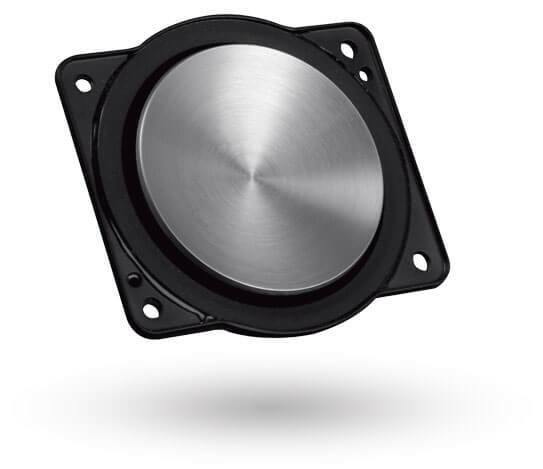 The 2.25” full-range drivers are custom-made with aluminum-alloy diaphragms and oversized 1” voice coil. Each full-range driver encompasses the combined benefits of a mid-range woofer and tweeter in a smaller package, which they are capable of producing a wider side-field dispersion pattern. The side grilles are also optimized to further improve the effectiveness of side-throw forming the surround pattern. The bespoke 1” coated aluminum-alloy dome tweeters are specially shaped and coated. 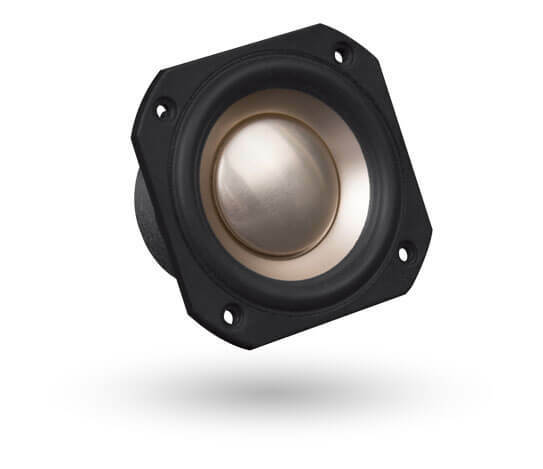 Together with its carefully optimized joint between the voice coil and dome, the tweeters deliver wide dispersion and extended high frequency response to 40kHz. 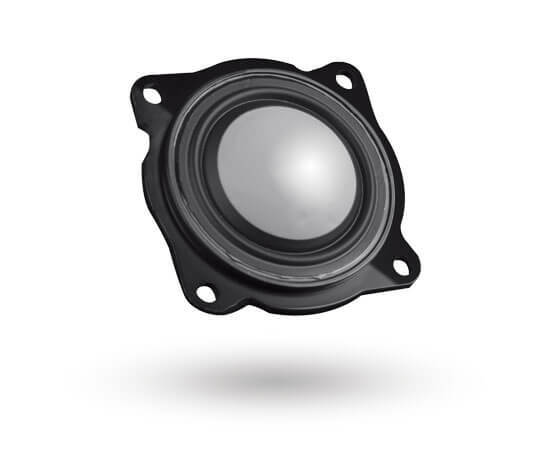 These tweeters are also optimally matched to soft rubber surrounds to lower its treble distortion, while providing clean, uncolored and detailed high-frequency reproduction. Connected to the main unit via a zero-latency wireless speaker link, the subwoofer unit houses two 10” subwoofer drivers in a push-push configuration – providing the same surface area and bass output of a single 14” driver, but with a much slimmer profile, and none of the unwanted vibration. Two dual-flared, port tubes loads each of the drivers equally for optimal performance. A conservatively rated 2 × 300W RMS channel amplifier is used in the subwoofer, individually driving the subwoofer drivers for maximum control and efficiency. Consistent with the driver design philosophy of the Sonic Carrier, each of the subwoofer driver features a tremendously strong aluminum diaphragm, purely pistonic in behavior within operational bandwidth for precise bass reproduction. The subwoofer driver further features an extra long throw, low distortion motor system for deep and powerful bass. 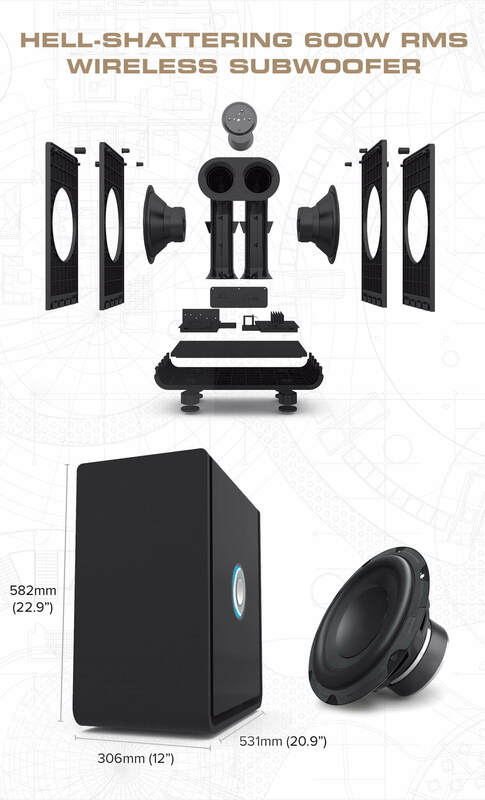 Bass quantity and quality could be upgraded phenomenally by adding up to 4 subwoofers wirelessly: averaging out response deviations, resulting in a bass response that is simultaneously smoother yet devastatingly powerful. “As I watched a Dolby Atmos clip of Kong: Skull Island, I marveled at how the soundbar itself did not — to my ears — appear to be the source of any of the sounds. The entire soundfield existed apart from the device creating it, which is the ne plus ultra of many audiophile experiences. I also enjoyed how Creative’s SuperWide X-Fi Stereo processing took music, like “Fever” with Ray Charles and Natalie Cole, and made it sound like it was coming from a real stereo system, not a soundbar. Bravely, Creative showed me how the SuperWide X-Fi processing made a YouTube trailer sound surprisingly immersive and expansive. I noted that I thought the effect was so good, that I would likely never turn it off. 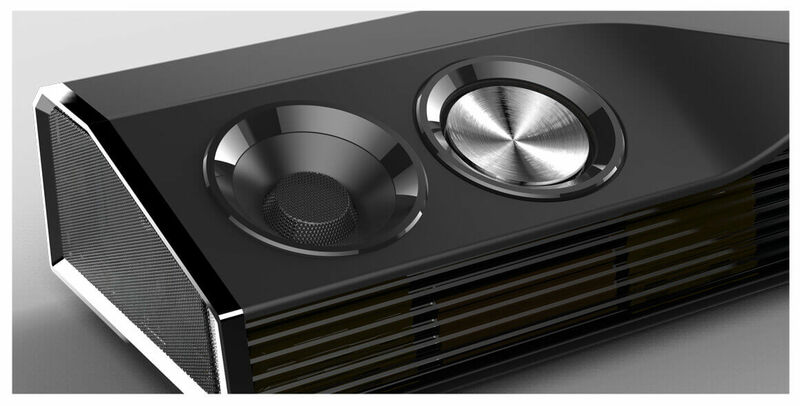 The quality of the holographic surround-sound the Creative X-Fi Sonic Carrier puts out is something I have not heard before from any soundbar. Oh, and the subwoofer. Wow. That’s easily the best wireless soundbar sub I have ever heard. 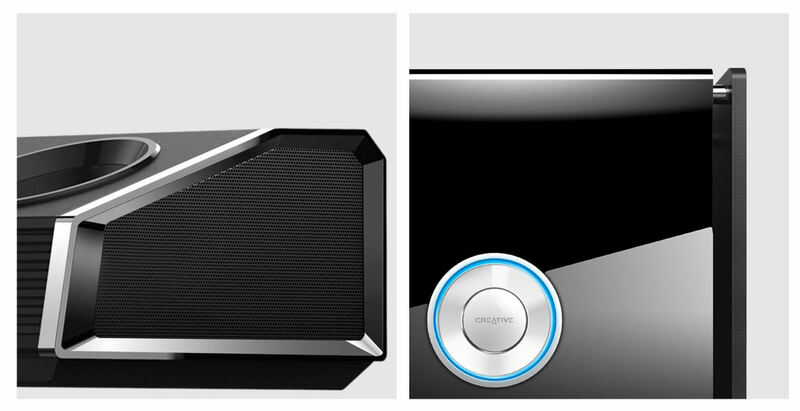 The Sonic Carrier is not just a powerful speaker; it is also an intelligent one. With the Sonic Carrier app for iOS and Android, you can control all the features of the Sonic Carrier and personalize every aspect of your audio – directly from the palm of your hand. The Sonic Carrier can be intelligently calibrated to the unique acoustics of any room it is in, so you always get the best audio possible. The Sonic Carrier App when activated will automatically calibrate the Sonic Carrier to adapt to your room’s acoustic environment to ensure that your speakers always perform optimally†. 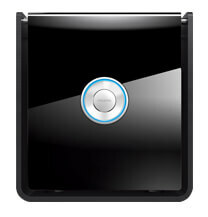 † The room calibration feature optimizes the speaker settings to get the best out from any room. However, rooms that are acoustically too harsh may require some upholstering. Lined up neatly in a row on the Sonic Carrier main unit are the buttons and indicators that provide convenient access to all the essential functions. Simply with a press of button, you can select an audio source, connect to Wi-Fi, adjust volume, tune mic levels, control media playback, enhance your audio, and more. The Quickplay buttons can even be programmed to activate any audio channel or source you desire instantly. A foldable LED display at the top also lets you know what’s going on, even in the dark. Designed with convenience in mind, the Sonic Carrier comes with an infrared transmitter port. When you position the Sonic Carrier main unit in front of your TV, depending on your TV’s design, the TV’s IR receiver may be blocked. Simply connect the supplied IR blaster to the Sonic Carrier and you will be able to communicate with your TV through the Sonic Carrier using the TV remote control. * Excludes shipping and installation charges. Shipping and handling fees are charged at US $150 per unit. Shipments are made only to destinations within the contiguous United States. We do not ship to Alaska, Hawaii, U.S. Territories or elsewhere in the world. It's been a long journey, but we have made it. 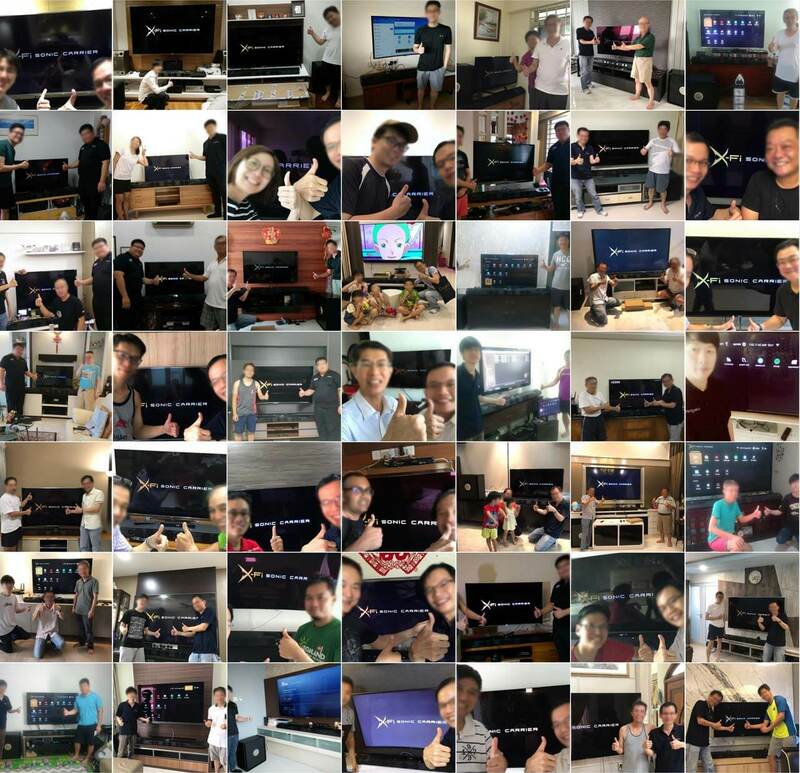 Today, the first wave of Sonic Carrier has been delivered to hundreds of customers in Singapore, and all of them have given Sonic Carrier their big thumbs up! We are also delivering to our customers in the USA, with more to come. Sign up for updates and the chance to WIN A SONIC CARRIER.